I'll leave the authenticity to the ones who do it best. In the meantime, I've enjoyed tinkering with this recipe and this is what I've grown to appreciate best. It is a very lightly smooth textured mousse-like creamy filling. Versatile enough to add your own personality to it.
. > * Note: Do not use container Ricotta for this recipe. I highly recommend an effort towards buying the best fresh Ricotta...please inform yourself through your Cheese specialty store.
. Get all the other 'Add-in' selections prepared and also set aside.
. Lightly with a spatula, gradually fold the whipped cream into the ricotta mix and combine until streaks have disappeared. 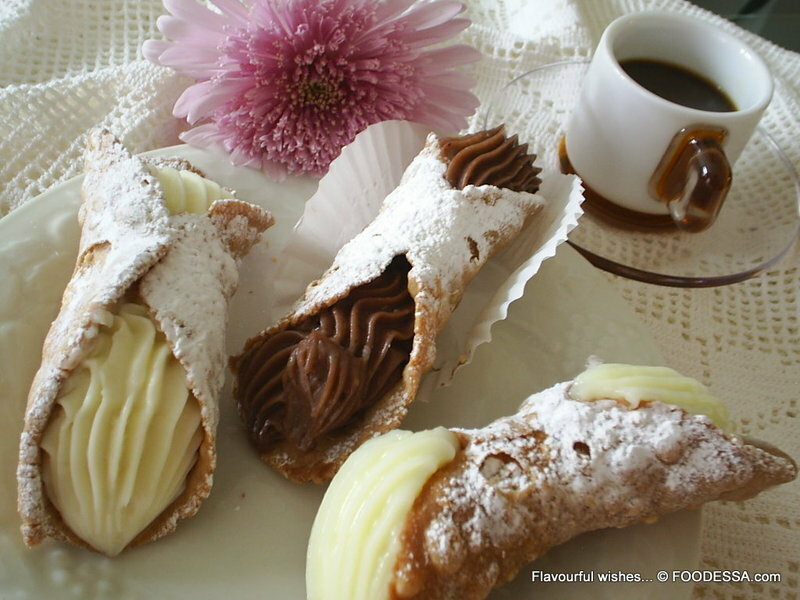 Lastly, gently fold in the rest of your 'Add-in' selections and you're done.
. Cover and place into the refrigerator for at least 30 minutes before pipe filling the cannoli shells. Note: This mix can be done the day ahead and piped right before serving. The shells will be crunchier that way. I make my own shells and think they are so much better. They are lighter and you can add a little cocoa to make cholocate shells. I'll post the recipe at some point. This filling sounds really nice. I'll be in New England in the Fall and I think I'll make these for my family. We get fresh maple syrup, will be a nice change. I agree about the Ricotta, shouldn't even bother making them if your not going to use the best qualaity you can buy. Ok, I am officially drooling over this recipe! 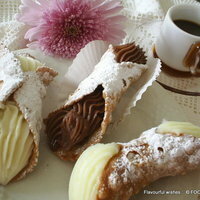 I would love to try making my own cannoli, since it is something that is not readily available where I live. And, I just got some maple syrup, so this sounds like a lovely use for it.